CHECK this site frequently leading up to the event for up to date information and any adjustments to the race. Just because winter has rolled around doesn’t mean you can’t still sneak out on the water for some fun. 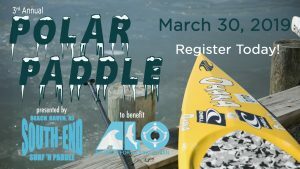 Throw on your wetsuits and booties, a wool cap and join us for a winter paddle race in the frigid (hopefully not frozen) waters of Barnegat Bay. A race course around Mordecai Island, either one lap (2 miles) or two laps (4 miles) will test your cold weather paddling prowess. We’ll also have a fun paddle for those not so sure about the temperature. The race benefit Alliance for a Living Ocean. Alliance for a Living Ocean was created in 1987 to put an end to ocean dumping. Since that time, ALO has continued efforts to stop pollution and protect our coastal environment. Through the dedicated work of our volunteers, ALO strives to keep our oceans, beaches, and bays clean.